DEAR KIM: I hear complaints like yours on a more frequent basis as each year passes. It is easy to get discouraged and think that the quality standards and craftsmanship of the entire construction industry is in a state of decline. The truth of the matter is there are still builders, tradespeople, and manufacturers who strive for perfection and try to do the best job possible on a routine basis. Unfortunately, I believe this group is a minority. To make matters worse, competition for sales and the creation of affordable housing for all segments of the marketplace often are the source of problems like yours. Plastic plumbing drain lines are noisy. Cast iron is a much better choice. The residential one and two family dwelling building code is a wonderful document. Over the years it has become more refined and detailed so that the consumer gets a better product. But keep in mind that the building code is a set of minimum standards. Frequently manufacturing and trade associations publish more stringent and detailed guidelines that exceed building code requirements. Sometimes it can be quite costly to build to a higher standard. But in many, many instances it doesn't cost that much to include different materials or labor practices that produce a finished house that will rarely disappoint a homeowner. When you get ready to develop specifications for your dream home, consider the addition of inexpensive one half inch diameter steel bars to concrete sidewalks, driveways and patios. They will greatly enhance the strength of concrete and will help hold the concrete together when it cracks. If your house will include a basement, make sure the exterior of the foundation has a true waterproofing treatment, not the hot asphalt damp-proofing I see being installed on many foundations in my area. Consider extra height walls that produce taller finished basement ceilings. Your bouncy floors probably do meet code. If you want stiff, rigid floors, then you need to purchase joists that are wider or deeper. In other words, if your current house has 2x10 floor joists, then you might want to upgrade to 2x12 joists. You can also use engineered floor joists or floor trusses. To make sure the floors will be stiff, have a residential structural engineer verify your selection. Plumbing system noise can be stifled by substituting cast iron for plastic in drainage pipes that handle water. 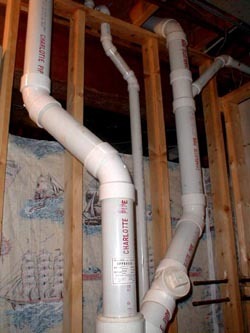 To save money, the plumbing vent pipes and drainage piping below slabs can still be plastic. Water supply lines can be noisy if they are undersized. Consider increasing the size of the main feeder lines that deliver water to all fixture groups. Larger diameter pipes slow the velocity and minimize turbulence of water as it travels towards a sink, toilet, or shower. Simple fiberglass sound insulation batts wrapped around the pipes that are hidden in walls and ceiling will also muffle noise. Not all windows meet voluntary industry standards. Purchase windows that carry the AAMA/NWWDA, or NFRC, or Energy Star label. Windows and doors can be the largest source of energy loss in the average home. You want to buy the best possible product for your dream home. If you live in all but the driest parts of the nation and intend to use asphalt roofing, make sure you purchase algae resistant shingles. Have the roofer use 40 lb tin instead of 20 lb tin for all flashings. The high performance ice and wind blown rain barriers are excellent upgrades as well if your budget has room. Request that all face nailed exterior siding and trim be fastened with stainless steel nails instead of traditional galvanized nails. To protect yourself completely, I urge you to obtain a copy of the residential building code. The new code is written so that it is easy to understand. It also contains many helpful diagrams and illustrations. It is in your best interest to monitor the construction process and match sections of the code to the building process. Although you are not a trained inspector or builder, you may be able to spot problems or deficiencies before they are hidden or become major problems that are expensive to correct. A realistic and well-illustrated book for teaching basic skills needed to read, study and understand construction plans is Construction Print Reading. In this book you will find a Unit on Specifications. The sample specifications are well-organized but I don't necessarily agree with some of the technical aspects of some of them. For example, they have a sentence about concrete thickness. It states that driveways should be 4 inches thick. I feel the minimum thickness should be 5 inches. So, I suggest you use the book to give you the outline for the specs, but use my past columns and Builder Bulletins to provide you with the actual numerical value or level of quality for each area of the specifications. If you are like me you have dreamed of owning a home away from home. Imagine when the weekend comes, hanging out in a hammock at your own lakefront cottage -boating, antiquing in a charming little town, or whiling away an afternoon on your ocean-view porch.If you have imagined these things you need Second Home: Find Your Place in the Fun (Better Homes and Gardens). This inspiring volume will help you turn your second home fantasy into the real thing. This book will take you through tours of gorgeous homes to see how other people have created their own great escapes. There are expert tips on everything from real estate shopping to building, remodeling, and decorating. There are hundreds of spectacular color photographs of beautiful homes and great locations. As for me, I'll keep dreaming.....until those lottery numbers come through or some forgotten relative leaves an unexpected inheritance, the book will have to suffice. Choosing a home builder is a big decision, but these tips should make it a lot easier. You should definitely do all of the research that you can on potential companies to prevent making a bad choice! Thanks so much for sharing these tricks.